Hundreds of people bike up Pike Street every day, but they have no dedicated space, jostling with cars and buses as they climb the hill. On September 21, 2018, one block of that hill was a bit safer and easier. 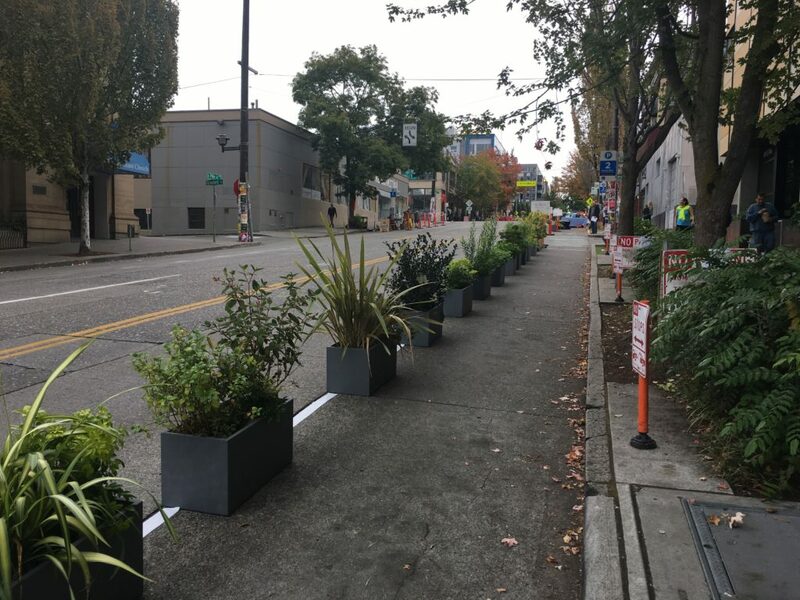 For Park(ing) Day, Central Seattle Greenways and our friends at Cascade Bicycle Club, the Capitol Hill EcoDistrict, and the Northwest School transformed parking spaces into a protected bike lane. It was the ultimate in tactical urbanism — quickly built using planters generously donated for the day by Ragen & Associates, orange plastic bollards provided by SDOT, and signs created by volunteers. Snacks, courtesy of Central Coop, awaited those who opted to stop and talk with us for a while. Planters made the lane aesthetically pleasing. Several people were disappointed to find out this wasn’t a permanent improvement. Park(ing) Day provides a great chance to highlight opportunities to make space for people in general. 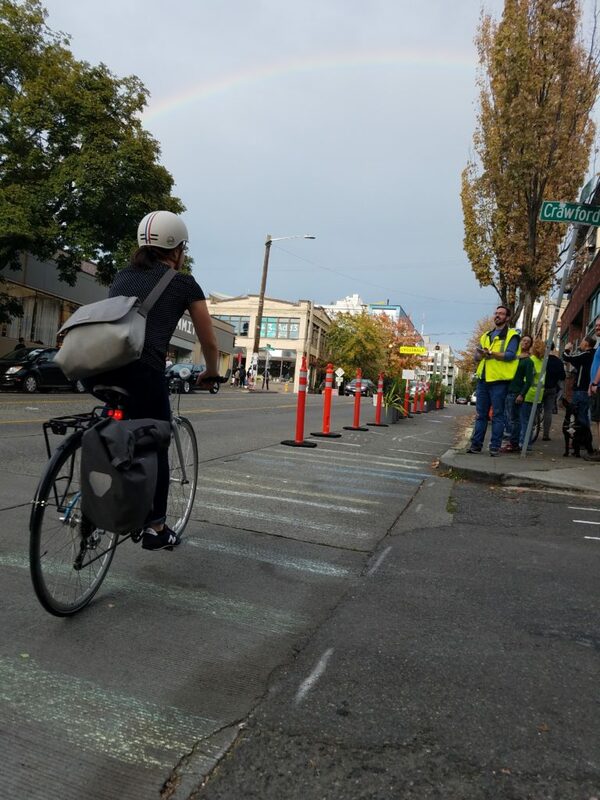 This year’s pop-up protected bike lane was also part of our ongoing project to ensure the community has a voice in the design of the protected bike lanes coming to the Pike/Pine corridor. We’ve also been reaching out to the business community to ensure their needs are met in the design and that they can participate in the process. 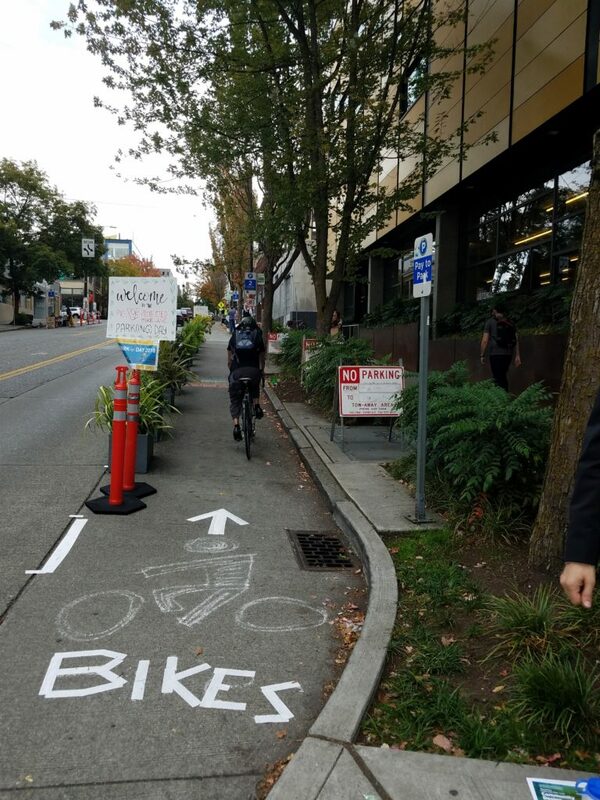 You can add your voice at the Pike/Pine Protected Bike Lane Community Design Workshop on Thursday, October 25! Though we felt only a few sprinkles during the day, we enjoyed a rainbow late in the afternoon. Surely a sign of great things to come!